Lake Erie Beach #1 is a 1997 Spartan chassis/RD Murray custom body pumper. It is our "attack" pumper, which means it is the first due in for all structure fires, alarms of fire, and Carbon Monoxide Detector alarms within our protection area. It is a 1500 GPM Hale pump with a 1000 Gal. tank. This unit also carries a 6K generator with a 250' electrical cord reel for electric power on scene. The generator also provides power for our four on board halogen scene lights. This vehicle carries a hydrant assist valve (used to boost hydrant pressure if necessary) preconnected to 1500' of 5" diameter LDH(Large Diameter Hose). There are six preconnects of the following lengths and sizes: 100' of 1 3/4" front discharge,150' of 1 3/4" attack line, 200' of 1 3/4" attack line, 250' of 1 3/4" attack line, 250' of 2 1/2" attack line, 250' of 1 3/4" rear discharge, 500' of 1 1/2" rubberized rear automatic hose reel. L.E.B. #1 also has Three suction inlets,one located on each side of the vehicle and one front suction mounted into the front bumper. This vehicle also carries a class 3 HTT portable foam system. L.E.B. #1's Spartan cab seats 5 personnel including the driver. All seats, except for the driver's adjustable air-ride seat, are "911" seats with integrated SCBA units. The driver and "radio operator" both have full access to the fire radio and electric siren which are both mounted on swivel bases. The driver has a steering wheel center button which activates the air-horns and a floor mounted switch to activate the Federal "Q" siren. The "radio operator" has two floor mounted switches to activate these two warning devices. The warning lights are all Code3 lights including an XL3000 lightbar and dual front Oscillasers. 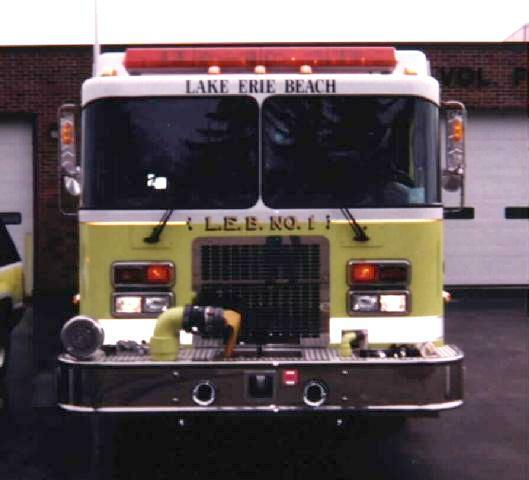 On April 25, 1998 the Lake Erie Beach Volunteer Fire Company Dedicated into service our #1. Pictures and information about the dedication can be found here.